Assemble the bottom pole frame in the pole guides on the underside of the carrier (Fig 1). Run (2) of the poles through the pole guides into the sewn pole pockets (Fig 2). Slide the cross pole assembly onto the (2) pole ends (Fig 3). Run the remaining (2) poles through the hook-&-loop-close pole pockets, through the pole guides and into the pole junctions (Fig 4). Make sure all of the pole frame segments are firmly locked together by checking the pole buttons (Fig 5). 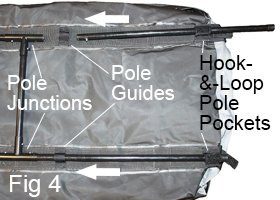 Close the hook-&-loop pole pockets (Fig 6). It is important to clean the back of your vehicle first. Unscrew your license plate and place it inside the Car Back Carrier’s interior license plate sleeve (Fig 7). Load the Car Back Carrier on the ground. 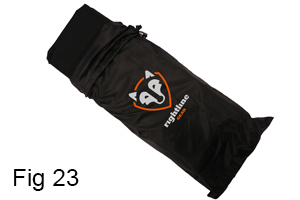 This carrier is designed for duffel bags, suitcases, tents, sleeping bags, coats, and other relatively soft and lightweight items. Please avoid coolers or other heavy items. The load capacity of the Cargo Saddlebag is ~ 100lbs. Don’t exceed the load rating of your vehicle’s attachment points. Pack the cargo bag full, evenly distributing the load. Place items with sharp or pointed edges in the middle and pack softer items around them. Close the Carrier by bringing the (2) zipper pulls together. Fold the protective flap down to secure the hook-&-loop closures (Fig 8). Make sure the hook-&-loop-closures on the zipper flap completely overlap those on the carrier. If it is difficult to secure the closures, the Carrier is over packed. NOTE: The belt strap is optional if you attach the bottom straps to your vehicle (see "Attach The Bottom Straps"). Open the vehicle’s rear hatch door just enough to run the belt strap around the inside of the door (Fig 9). Make sure the strap is not twisted. Pull the (2) strap ends tightly to tension the strap, close the door over the strap, and let the (2) strap ends hang down (Fig 9). After attaching the Car Back Carrier to the vehicle (see "Attach The Car Back Carrier-..."), adjust the belt strap to the correct length/tension by sliding the tri-glide. Buckle the belt strap around the middle of the Carrier (Fig 10). NOTE: Requires space under the roof rack side rails or cross bars for the Carrier’s side straps to pass through. Remove the Rear Car Clip from each of the (2) long side straps by unthreading the strap end through the tri-glide and pad and removing the male buckle from the strap. Add the male buckle back onto the strap and run the strap end through the buckle, the pad, and the tri-glide (Fig 11). Make sure the strap goes through the correct side of the male buckle (Fig 22). Lift the Carrier above the vehicle’s bumper and loop the (2) long side straps around the vehicle’s rear cross bar or (2) side rails. If using the rear cross bar (Fig 12), it may be necessary to move the cross bar towards the rear of the vehicle. If using the side rails (Fig 13), run each strap from the inside to the outside of each rail. Continue with the section titled "Adjust the Side Straps"
Lift the Carrier above the vehicle’s bumper and place the (2) Rear Car Clips (Fig 14) in the gap between the vehicle’s rear hatch door and roof (Fig 15 and Fig 16). Buckle the (2) long side straps to the (2) short side straps (Fig 17). Make sure the roof protection pads (Fig 16 or Fig 18) are facing downward on the top rear corners of the vehicle. The side straps can be routed around the vehicle’s rear fairing if necessary. Adjust the (2) long side straps to the correct length by sliding the tri-glide (Fig 18); make sure the bottom of the Car Back Carrier sits level with the top of the vehicle’s bumper. Move each strap’s tri-glide to the end of the strap’s loose end (Fig 18) so that the strap will not flap in the wind. To adjust the tri-glide’s position, first lift the end of the Car Back Carrier slightly or momentarily unbuckle the side strap. On some vehicles, the tri-glide may need to pass through to the other side of the pad (Fig 16). NOTE: Requires attachment points at the tow hitch, bumper, or frame behind the bumper. If no attachment points are available, the bottom straps can be set aside but the belt strap must be used. Run the (2) bottom straps through the guides on the bottom of the carrier (Fig 19) and around the attachment points. The straps’ length can be adjusted by moving the tri-glides. Thread each strap’s end through its buckle (Fig 20) and tighten the (2) straps evenly (Fig 19). Tie off each strap’s end so it doesn’t flap in the wind (Fig 19). Place the Carrier top side up. Extend one of it’s long side straps out. Make sure the strap is not twisted (Fig 21). Unthread the strap end through the tri-glide and pad and remove the male buckle from the strap (Fig 22). Add the Rear Car Clip and the male buckle onto the strap (Fig 21). Make sure the strap goes through the correct side of the buckle and the Car Clip (Fig 22). Run the strap back through the male buckle, the Rear Car Clip, the pad, and the tri-glide (Fig 14). Repeat steps 1 - 4 for the second long side strap. Emergency access to the rear door and/or window of your vehicle will be extremely limited when using this product. No occupants in the vehicle should require entry/exit through the rear door while the Car Back Carrier is attached. Make sure that you have a clear view through the rear window before driving. The rear hatch door and its accessories (e.g. window, wiper, back up camera/alarm, etc.) may not be operable while the Car Back Carrier is attached. When the car back carrier is fully loaded, the straps are snug, and the loose ends are tied off, you are ready to go. We recommend a test drive around the neighborhood before you get underway. Remember to check the straps regularly throughout your trip. Keep the Car Back Carrier and its straps away from the vehicle’s hot exhaust system. Don’t exceed the load rating of your vehicle’s attachment points. The side straps can be routed around vehicle rear fairings if necessary. The Car Back Carrier folds down when not in use. Separate the bottom pole frame pieces and remove them from the carrier. 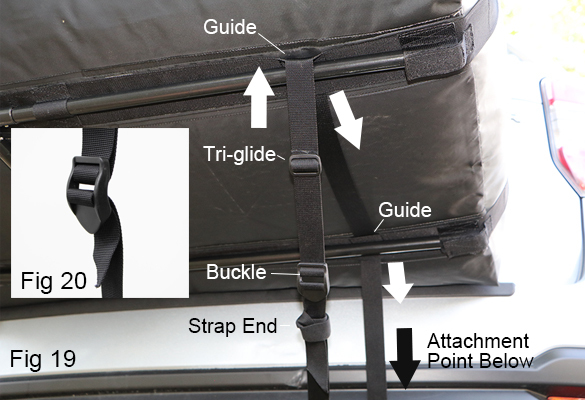 Place the frame pieces inside the folded luggage carrier before sliding it into the stuff sack (Fig 23). The stuff sack has a draw string closure.